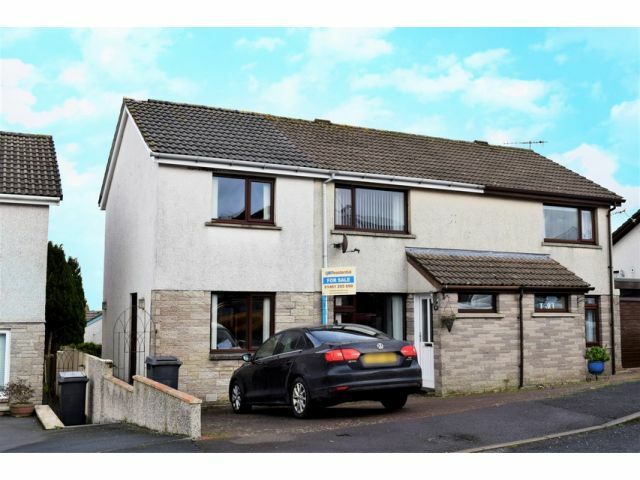 Located in the popular residential area of Cargenbridge, which benefits from a local shop, a highly regarded primary school / nursery and is within close proximity of the recently opened Dumfries & Galloway Royal Infirmary. Providing a spacious Lounge, Modern Kitchen and Useful Second Reception / Utility Room. Master Bedroom with En Suite Shower Room, Two Further Bedrooms and Family Bathroom. Driveway parking for several vehicles and a large enclosed rear garden split over two levels with patio and low maintenance sections. Thinking About Moving? We can arrange a FREE, no obligation valuation of your current property. Window to front. Two ceiling lights, smoke alarm, meter cupboard. Radiator, laminate flooring. Window to front with blinds. Coving, two ceiling lights and recessed light, smoke alarm. TV point, telephone point. Storage cupboard. Radiator, laminate flooring. French doors with curtain pole leading to rear garden. Window to rear with curtain pole and blinds. Recessed lighting. Range of wall and base cabinets, connections for gas cooker, cooker hood extractor fan. Sink and drainer with mixer tap, splashback. Plumbing for washing machine and dishwasher. Space for American style fridge freezer. Vinyl flooring. Window to front with curtain pole and blinds. Ceiling light, wall light, TV point. Radiator, vinyl flooring. Door to outside. Loft access. Ceiling light, smoke alarm. Carpeted flooring. Window to front with blinds. Recessed lighting, telephone point. Radiator, carpeted flooring. Window to rear with curtain pole and blinds. Recessed lighting. Three piece suite comprising of toilet, wash hand basin set into vanity unit and shower cubicle with mixer tap. Radiator, vinyl flooring. Window to rear with blinds. Ceiling light, radiator, carpeted flooring. Window to front with curtain pole and blinds. Ceiling light, telephone point, storage cupboard. Radiator, carpeted flooring. Opaque window to rear with blinds. Recessed lighting, splashback. Three piece suite comprising of toilet, wash hand basin and bath with over head electric shower. Radiator, vinyl flooring. Driveway to front with parking for three vehicles. Access at side to large enclosed tiered rear garden with low maintenance sections, patio and decked area. Rotary clothes drier. Offers in the region of £135,000 are invited and should be submitted to lj Residential, 93 High Street, Annan, DG12 6DJ or by fax to: 01461 205037.